Choosing skis can be daunting, but we're here to help you. Picking the right skis begins at the most basic level by knowing what length is appropriate for you. This is strongly influenced by your ability level but also by your riding style and terrain choice. Let us guide you through the process below! What Size Should My Skis Be? You skis should be the right size for your height, weight and skiing style & ability. There is no magic formula for determining the right size ski for you. In general, the proper ski length is somewhere between your chin and the top of your head. 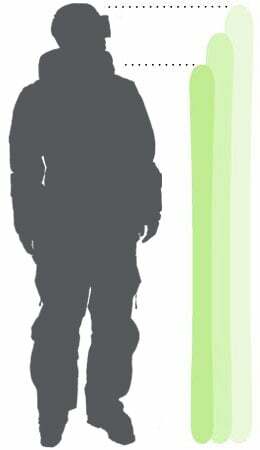 For example, a skier that is 6’ tall will want to look for skis between 170cm and 190cm. The exact right size for you will depend on your skiing ability and style. For sizing kids’ skis, see our How to Choose Youth Skis Chart and Guide. So what is better? The answer: No one profile beats the other and it really comes down to your personal preference. Typically, camber offers better edge hold and stability on hard pack and at high speeds, while rocker offers more float in the powder and a more forgiving ride. Some rocker can be great for beginners because it facilitates easier turn initiation. Advanced riders who like a loose feel may also enjoy riding rockered skis. Check out our Rocker Guide for more information about rocker and its benefits.